I really enjoyed the course. There was a small group of just 6 us in class for two weeks, then 3 or 4 in the group for the following 2 weeks. With this small class size, we had plenty of opportunities to speak Italian individually. The teacher, Enrica, was very skilful at drawing us out and was very nice. We all liked her a lot. The course was a mixture of discussion, speaking, using grammar, verbs, etc. We also had quite a lot of homework, which was good for reinforcement. 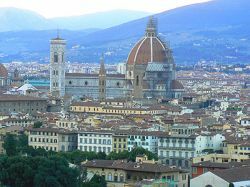 Florence is a very special city- pretty and stylish, romantic and arty. Studying Italian here couldn’t have been dreamier! I found so much to do and see whether walking around the city, marveling at the art, learning how to cook Tuscan specialties, or simply just relaxing by the picturesque Arno River- I truly enjoyed myself! The school is fantastic; it is actually a beautiful 17th century palace! It is situated right in the historic centre of Florence, which makes the most famous bridge in Italy – the Ponte Vecchio, its backdrop. While sitting in class, the bridge was in clear view from my window, which was perfect for taking impressive photographs! All of the staff in the school welcomed me in straight away, and it was obvious that the teachers loved their job. Each Italian class was more fun than the next! 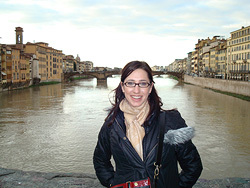 Italian and culture in Florence! Florence is totally, utterly, completely… incredible! Wow. It is THE city of renaissance. Which, (unless you are a super history buff) might not mean much until you arrive… but then you arrive, and… Wow!! As you can tell, when I arrived in Florence, I was lost for words. You might start your time, like I did, by going for a stroll across the famous Ponte Vecchio. And as you wander along this centuries-old bridge, which is lined with centuries-old shops, and feels like a street, apart from when the shops part for a view of the River Arno either side of you, you start to think; my god, this is amazing, I have never seen anything like this in my life! You can then stop to take in the view down the Arno from the bridge, and you’ll be thinking; wow, this view of the city is awesome, and look, I can even see the dome of that massive duomo church thing from here! (Ha ha, which I later discovered is more accurately known as Bruneschelli’s dome). So then, you get to the other side of the bridge, all the time soaking up the lively, bustling atmosphere. Sightseers mixing with Florentines, mixed in with the buzzing of little mopeds zipping along the cobbled roads. A public holiday in Florence! Breathtaking. It’s the only way to describe the Duomo. Actually, that’s a lie, as you could also use awesome, ornate and gargantuan! I arrived in Florence by train one evening, and as the city seemed fairly compact (on my map at least! ), I decided to walk to my accommodation, passing the city’s most famous attraction en route. From the station, Piazza del Duomo is reached by walking along a central shopping street, busy with shoppers and traffic. As the road curved slightly, I caught my first glimpse of the Duomo. I couldn’t believe how enormous it was! It was a little late, and after weighing up the situation, I ignored the excited tourist within me and made my way to the apartment. I’d make sure I was well rested for the next day.